There are a number of things that all homeowners can do to make significant reductions in their energy consumption, whether or not they are embarking on a major home construction or remodeling project. These include the following steps that the owners of this house have taken to reduce their energy use and that in turn contribute to the overall energy efficiency of the house. Just as keeping a record of the foods eaten each day can help people eat less and lose weight, so can keeping track of the amount of energy used help homeowners reduce their energy consumption and their energy bills. The owners of this house had always considered themselves to be pretty savvy about using energy efficiently but discovered that they could do a lot better when they began monitoring their actual energy consumption in their former home. They experimented with compact fluorescent lights (CFLs) in a few fixtures and saw the impact immediately in lower electric bills. They gradually replaced most of the incandescent bulbs in the house with CFLs, ultimately reducing their electrical consumption by 30 percent. 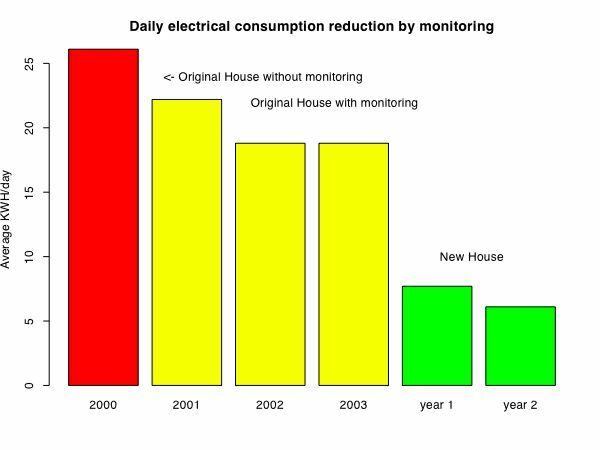 Electrical consumption in the new house is roughly 70 percent lower than it was in the former home. Big contributors to this high performance include wide use of CFLs, of course, as well as the selection of a super-efficient clothes washer and a super-efficient dish washer, and reliance on ceiling fans in the main living areas rather than air conditioning on all but the hottest days. Daily monitoring of energy usage continues and has led to further adjustments. Consumption is lower in year two, for example, because the owners turned off the small basement refrigerator during the winter months and discontinued the use of the (unnecessary) air handling system. 2. Replace incandescent bulbs with CFLs or LEDs. Most of the energy consumed by a standard incandescent bulb is wasted; 90 percent is given off as heat while only 10 percent is converted into light. CFLs and LEDs are much more efficient, using roughly one-fourth of the electricity an incandescent bulb consumes to give off the same amount of light. CFLs cost somewhat more initially, but they last ten times longer and easily pay back their higher purchase price through lower utility bills. LEDs are more costly still, but they are getting cheaper and more energy efficient each year. They have the potential to last up to 22 years and save 75 percent or more in energy costs. An ENERGY STAR label on the packaging means the light bulbs meet strict criteria set by the EPA for both energy efficiency and quality. Halogen lights use slightly less energy than standard incandescent bulbs, but they put out a great deal of heat. This can be dangerous (especially in the case of halogen torchieres) and can also add to the cooling load of a home during hot weather. By comparison, CFLs are nearly three times as efficient and produce far less heat. CFLs are now available in hundreds of different styles and a range of colors, including "warm" colors comparable to incandescent lamps. The color that a light bulb will emit is indicated by its Correlated Color Temperature (CCT), which is measured in degrees Kelvin. Incandescent lamps have a CCT of 2700 as do the residential CFL models typically found in retail stores. CFLs with higher numbers (and correspondingly "cooler" colors) are also available, from a warm white (3000 degrees K) to a cool white (4100 degrees K), and even higher. Lamps in a shared space will look best if they are all of the same color temperature. CFLs are used almost exclusively in the new house. (LED technology and product choice were not well developed in 2002-03 when the house was built.) Exterior landscape lighting is solar-powered. ENERGY STAR-labeled appliances meet strict guidelines for energy efficiency set by the U.S. Environmental Protection Agency and the U.S. Department of Energy. The label helps consumers easily identify products that use less energy, reduce home utility bills, and help protect the environment. The savings can be significant: a home that is fully equipped with ENERGY STAR-qualified products will operate on about 30 percent less energy than a house with standard products and will save the homeowner about $450 per year. A companion program--the Super-Efficient Home Appliances Initiative of the Consortium for Energy Efficiency (CEE)--promotes a subset of "super-efficient" ENERGY STAR appliances. As part of this initiative, CEE has developed performance specifications for super-efficient clothes washers, dishwashers, refrigerators and room air conditioners and endorses appliances that are generally in the top 25 percent of efficiency. A third resource for consumers is the yellow-and-black EnergyGuide label that manufacturers of most major home appliances are required to attach to their products. Appliances covered by the Federal Trade Commission's Appliance Labeling Rule include refrigerators, freezers, dishwashers, clothes washers, televisions, window and central air conditioners, water heaters, furnaces, boilers, heat pumps and pool heaters. The label provides an estimate of that appliance's annual energy use, together with estimates for similar models, as well as an estimate of the annual operating cost for the appliance. Even among ENERGY STAR-qualified clothes washers there is a wide range of efficiency, with some models as much as two to four times more efficient than others. The more efficient the machine, the higher its Modified Energy Factor (MEF), which takes into account the capacity of the tub, the energy used for a load of laundry, and the dryer energy required to remove the remaining moisture in the wash load. Since heating water accounts for 80-85 percent of the energy used in washing clothes, selecting a machine that uses less water is also important. The lower a machine's Water Factor (WF)--the number of gallons of water needed for each cubic foot of laundry--the more efficient its use of water. Using cooler water for washing and rinsing can also make a big difference; switching temperature settings from hot to warm water can cut energy use in half. According to the American Council for an Energy-Efficient Economy, front-loading washing machines continue to earn the highest energy-efficiency ratings. These horizontal-axis machines tumble the clothes in a partially-filled tub of water; by contrast, vertical-axis top-loading machines fill up completely with water and agitate the clothes to clean them. Newer top-loading models that spray rinse water on the clothes (rather than soaking them in a full tub) are more efficient than traditional models, but they don't rank among the ACEEE's 20 top-rated machines. Front-loading washers are generally are more expensive than vertical-axis washing machines, but their substantial energy and water savings more than offset their higher purchase price. Although clothes dryers also use a significant amount of energy, they are not rated by ENERGY STAR because the different models don't vary much in the amount of energy they use. (A rating program is in development.) Nor are clothes dryers required to display an EnergyGuide label. The more energy-efficient dryers are those with a control that shuts off the machine when the clothes are dry. These controls range from simple timers, which rely on the user to guess how long the load will take to dry, to temperature sensors, which indirectly estimate dryness by sensing the temperature of the exhaust air, to moisture sensors--the most effective--which directly measure dryness. Taking into account the energy used to convert and deliver electricity and natural gas to the home, gas dryers use much less energy than electric models -- about one third as much. In most parts of the country, gas dryers also cost less to run than electric dryers. For dishwashers as for clothes washers, most of the energy used is the energy required to heat the water consumed. An efficient dishwasher, therefore, is one that uses less water to do the job. The most water-efficient dishwashers on the market today use about five gallons of hot water per load in light or energy-saving cycles, compared to eleven gallons or more for conventional dishwashers in the same mode. In addition, virtually all dishwashers available today have a built-in booster heater, which further heats the water to the higher temperature required for dishwashing. This allows the homeowner to reduce the setting for the home's hot water heater to 120°, the highest temperature needed for other household uses. Another energy-saving option is a switch that allows the user to choose between heated- and unheated-air drying. Of all appliances, refrigerators are the single biggest consumer of electrical power in most households, accounting for some 15 percent of all residential electrical usage. Advances in technology over the last 20 years, however, have improved refrigerator efficiency substantially, making it cost-effective in many cases to replace a still-working refrigerator with a current model. (Use the ENERGY STAR savings calculator to find out how much you can save by replacing your current frig.) ENERGY STAR-qualified refrigerators are about 15 percent more energy efficient than standard models that meet the minimum federal energy efficiency standard. Fresh, clean water is scarce and getting more so. Reducing the demand for water can help to save rivers and wetlands, maintain aquatic habitats, and protect groundwater supplies. Moreover, conserving water is an important means of saving energy as it helps reduce the amount of electricity needed to treat and move potable water through municipal water systems. In addition to making water efficiency a criterion when selecting appliances (as described above), installing water-efficient plumbing fixtures can go a long way towards protecting this valuable natural resource. Toilets are the greatest water user in the house, accounting for over one-quarter of the total daily indoor water use in a typical single-family home. Installing high-efficiency toilets, however, can result in dramatic water savings. Federal law now mandates that all toilets manufactured in the U.S. must operate on 1.6 gallons of water-per-flush compared to the 3.2-gpf standard of older models. Replacing an old toilet with a 1.6 gpf toilet can save an average of 10.5 gallons of water per person per day. The dual flush toilets used in this house reduce water use still further. The key feature of these toilets is a 0.8/1.6-gallon two-button flushing system---one button for liquid waste and the other for solid waste. The EPA's new WaterSense labeling program can help consumers find high-efficiency toilets and other water-efficient products. In the case of toilets, the WaterSense label denotes a fixture that uses a maximum of 1.28 galons/flush. Water-efficient showerheads and faucets are also important water-saving devices. Under federal standards set in 1992, new showerheads must use no more than 2.5 gallons per minute. (Pre-1992 showerheads had a flow rate as high as 5.5 gpm.) )WaterSense-labeled showerheads use no more than 2.0 gpm. Flow reducers, which fit into the aerator at the tip of the faucet, can be installed easily in most conventional faucets. Newer, more efficient kitchen and bathroom faucets are also available. Federal guidelines mandates that they use no more than 2.2 gallons of water per minute. WaterSense-labeled faucets and aerators use even less. 5. Use window treatments to control heat loss and heat gain. The owners have installed Hunter Douglas duette shades on all the windows of this house and use them conscientiously--at night in the winter months to retain heat and on sunny days in the summer to block unwanted heat gain. Consumers looking for help in identifying energy efficient appliances will find information on more than 50 categories of products on the ENERGY STAR website. Also outlined are five easy steps that consumers can take to make their homes more energy efficient. The U.S. Department of Energy's Energy Savers Tips on Saving Energy & Money at Home offers an array of practical solutions for saving energy throughout the home. The American Council for an Energy-Efficient Economy's Consumer Guide to Home Energy Savings is a comprehensive reference to energy-efficient home appliances and techniques for saving energy around the home. A condensed online version, including a Home Energy Checklist for Action, is also available. Website prepared by Eleanor Revelle.